Early in December the United States Supreme Court is set to hear the case of Christie v. NCAA. In legal terms, the case is founded on the Tenth Amendment and the Commerce Clause, but at the core of the argument is the Professional and Amateur Sports Protection Act (PASPA) of 1992. The NCAA, NFL, MLB and other sports leagues argue that PASPA is necessary in order to protect the integrity of their sports. By making it illegal to bet on sports anywhere other than Las Vegas, the various sports governing bodies believe the games are less apt to be effected by game fixing. If you aren’t familiar with the term, game fixing involves players or coaches in the game accepting a bribe from a gambler and then not performing their best in order to “fix” the game and make sure the gambler wins his bet on the game. Legal experts seem to be split on how they think the Supreme Court will rule, but if the court sides with Christie, it could change the entire landscape of sports betting. The reason for it being Christie v. NCAA is because New Jersey Governor Chris Christie brought about the fight years ago in an effort to boost business for the state’s faltering casinos. If the Supreme Court rules in favor of the NCAA very little will change. However, if the Supreme Court rules in favor of Christie, it will essentially legalize sports betting in any state that wants to allow it. So to a degree it is about state’s rights. Should the Supreme Court rule to allow each state to decide, there are several companies that could benefit and they could benefit in several ways. First, you can bet that almost any casino operator with facilities outside of Nevada will immediately look to open a sports book at all of their existing casinos. One company that is known for having some of the best sports books in Las Vegas is MGM Resorts International (NYSE: MGM). Among the company’s properties in the city are The Mirage, Bellagio, and the MGM Grand. All three of which are known for having great sports books. Plus MGM already has Beau Rivage in Biloxi, Borgata in Atlantic City and the MGM Grand Detroit. While opening a sports book at these locations would seem to make sense, how could MGM and other casino’s draw in business? First of all, the estimated underground sports betting economy is worth an estimated $150-$400 billion. That is a pretty wide range, but it is hard to estimate an illegal activity as the players don’t really jump at the chance to take surveys. Obviously not all states will legalize sports betting and even in the states where it is legalized, casinos won’t gain all of the business as some will prefer to continue doing it through illegal means as they don’t have to report their winnings to the IRS. That being said, I am sure the legal casinos can expect to take a big chunk of the illegal bets as there is something to be said for placing a bet at a big shiny casino and knowing that you will be paid off should you win rather than dealing with shady bookies. Other potential winners in the decision are the offshore betting sites where many U.S. residents already place bets. Companies like Bovada, intertops.com, Sports Betting and X Bet are already taking bets from U.S. citizens and would likely try to expand their operations should the Supreme Court side with New Jersey. None of these companies are currently publicly traded, but an expansion may warrant going public or perhaps a public offering could be used to fund the expansion. 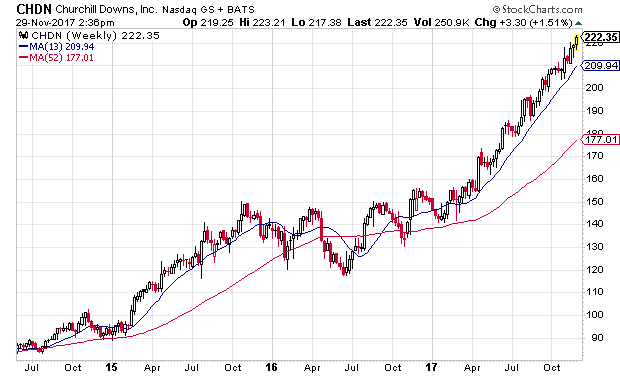 Another company that could benefit is Churchill Downs (Nasdaq: CHDN). 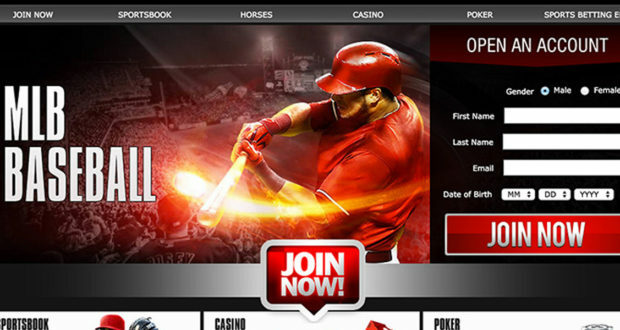 The company is already offering sports betting via its race tracks and it also offers other gaming operations through other affiliates such as TwinSpires.com. They seem to have the infrastructure in place and it could be easy for them to expand those operations in to other sports betting revenue streams such as football, baseball and basketball. 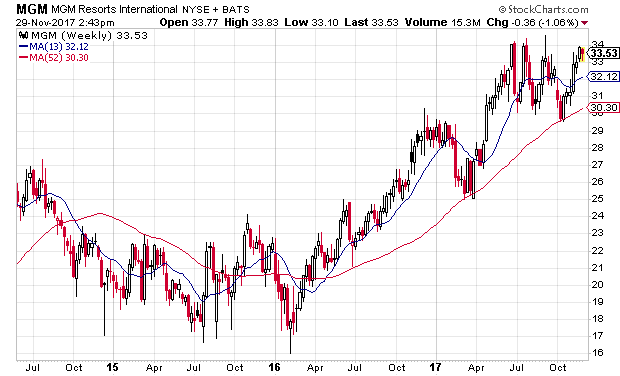 The company’s stock has been performing really well over the last few years and adding sports betting could extend the bullish run. While the decision from the Supreme Court is expected in December, it could take a while for states to approve and clarify their intentions on sports betting. I wouldn’t start investing immediately following the decision, but I would certainly have some stocks on my radar. MGM and Churchill Downs are certainly two of those stocks since they already have multiple gaming sites in numerous states. All Professional Sports are already fixed even college football & basketball depending on the line movements up/down = + or – through out the country. Money rules games, just like the stock market, Rothschild Zionist in Congress benefits the most from insider trading & they also control Las Vegas its a LOBBY MONOPOLY BIG TIME DONATIONS FOR THEIR CANDIDATES. This is the reason why THE LOBBY MONOPOLY WANTS TO KEEP THE BENEFITS IN LAS VEGAS,but in all fairness all the other 50 States should be able to get their fair share.